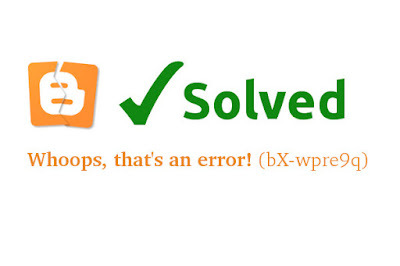 You may get an error message "Whoops, that's an error! 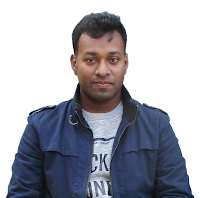 (bX-wpre9q)" while trying to import your exported XML (from Blogger or WordPress) Blogger XML file. Even you may face reCaptcha Verification problem again and again but not uploading the XML file. Really, it is very annoyed experience. In this post, we will discuss - how to solve this problem. If you get bX-wpre9q error code, it has two solutions. And solving the repeatedly annoyed reCaptcha verification problem has only one way but it is one of those above two solution. So we will talk about this first method. Just clear the cache and cookies from your browser. Make sure the speed of Internet connection. Try again, it will be solved. Don't forget, trying with good Internet Speed connection. N.B. The first method will be applicable for smaller size (Under 20MB) exported .xml file. Do you have more than 20MB exported XML file? Or the method-1 not working? Or are you facing reCaptcha verification problem repeatedly? No problem. The method-2 will be worked definitely. Yeah, it is the only one solution. Though Blogger has told that "There is no file size limit to import a blog, but the number of imports in a day is limited. "[Ref], but it is also true that, you can't import a lot of posts, pages, comments in a day. I didn't find any reason why they don't allow it. But I can guess, they don't allow because of focusing the important of blogging regularly, avoidance content copyright violation etc. Personally, I didn't face this type problem. But few days ago, I got a message from an Italian Client, Daniele Orlando Renzetti. He is facing this problem. He wants to hire me to solve this. He also asked for help in Blogger Group before hiring me. I requested him to send me the exported file so that I can find out the actual problem. You know, this exported file was more than 100 MB! So imagine how many posts,pages,comments in this file. I started searching any solution in Google result but I find nothing. Even in Official Blogger Group, nobody provide the solution. Then, I am starting to research on XML file only. 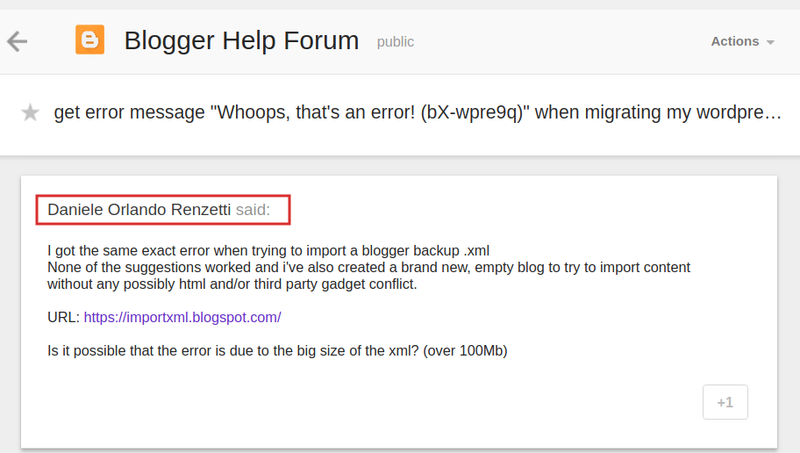 What may be the problem, if we upload larger any XML (not only Blogger) file. Yeah, I have found many problem may be occured due to larger file and the solution is Splitting the XML file. Even I have found some online free tools that offer splitting XML file as you want. I thought, the split file will work in Blogger. Alas! It didn't work. Again, I started research. After 2/3 hours I need to go to in Toilet 🚽 (please, don't mind) ! EUREKA! I found the solution. Finally I got it. But the worst matter is it is not easy. Definitely, you need a Blgoger Expert who can code in Shell Script. Daniele Orlando Renzetti left his feedback on Fiverr about my performance. N.B. Using method 2, can be cause of problem publishing all comments. But it can be solved by manually and it will take time. If you need any help, message me here.